A few years ago I was visiting a class at ESSA in which old pages torn from books were being used in art projects, and I found one page that grabbed my attention. It was about kindergarten and had a printed guide to paper folding, so I kept it as a book mark in one of my other early texts. I have been curious about its source. While I still don't know the name of the book from which it came, I did find a duplicate of the printed text on-line, as A list of Home Occupations for Children. The keynotes of the kindergarten handwork are two: expression, or "self-expression" as it is generally called, and development, or step-by-step progress, from easy to difficult, from simple to advanced, from familiar to new work. That is, the child has many sides of his nature which need other expression than words, and many ideas, especially the germs of artistic ones, which he could not put into words. He can, through his power of "creating," express them by materials. He has a chance to express, to clinch the perceptions of color, contrast, etc., which are awakened by the experiments with the gifts; and he expresses, besides, all his childish delight in nature and life, by trying to make the objects he sees about him. 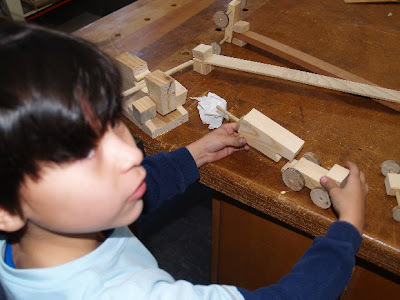 Froebel tried to provide a large range of materials, which covered many degrees of resistance, flexibility, or plasticity, so that a fairly complete set of life experiences might be expressed: string, clay, sand, chalk, seeds, worsted, paper, cardboard, peas with sticks, wooden slats, etc. A teacher uses these in a more systematic way than they can be used at home. The aim of home work is to use a variety of materials, so that the children can soon learn to employ themselves independently, and be happy in it; and to work, in some degree, from easier to more difficult things. Parents, these days are intent on spending money for technology to allow their children to keep up with the Joneses or the Chinese, depending on their particular argument of choice. Far better would be an investment in scissors and string. For this greater investment, at much less cost, the guide page I found torn from a book is a treasure. Use the link to gain access to parental wisdom often lacking in modern society. 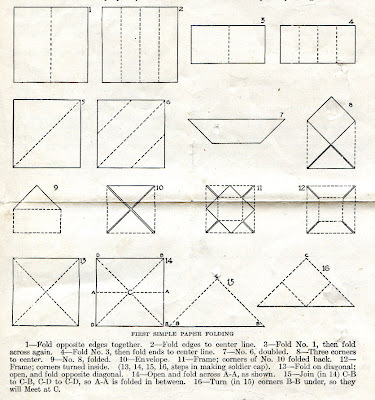 The image above is from my torn page showing a guide to paper folding techniques similar to Paper Sloyd. 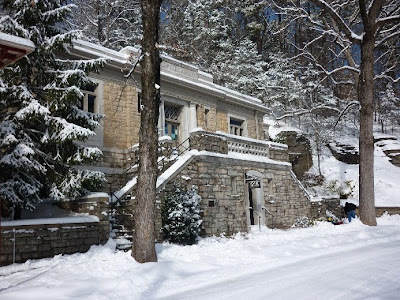 As usual when we have snow, one of the chores is to clear the steps, porch and sidewalks of our Carnegie Public Library. This time the snow was deep and my wife and I were pleased that a mystery volunteer had given us a head start. That didn't mean the job was complete, but it means a great deal to know that there are others in the community that care so much about the library as to take a stab at clearing the steps. I often grumble at the work, but always feel pleased to have offered simple labor to an institution that was here long before I arrived and will have been sustained in part by my efforts. I am the speck with shovel and black jacket at lower right. The following quote is from Vernon A. Howard's essay "Artistic Practice and Skills" from the Arts and Cognition. What practice is not. Many confusions engulf the notion of practice, none more perplexing than those relating to the nature and role of repetition, of "repeating the same thing" over and over. ... it is a popular misconception that practice amounts to mere repetition of exercises or of whole pieces until, somehow, the performer "gets it right," and can "do it without thinking." In this context "getting it right" implies an achievement threshold--performing up to some preconceived standard which requires at least a modicum of critical judgment at some developmental stage along the way. And while it is common to speak of practice as if it were merely repetition, more than that is implied from the start. It may seem kind of strange to those who practice some form of artistic endeavor, that practice, and the cognitive aspects of it would require explanation. But we live in a world in which the hands and their contributions to intelligence and character are too little known. Can do it well and explain it. Richard Baseley, shop teacher from Australia sent a link to an article from the Telegraph, Thinking out loud helps solve problems summarizing research that indicates a relationship between verbal expression and comprehension. Do you ever talk to yourself as you work out complex problems? I do. It may have to do with what Jerome Bruner called scaffolding. Is knowledge best built on a single branch of what Howard Gardner called "multiple intelligences?" Or is knowledge best retained and used when it is constructed on a platform of various experiences. "How do you break down the barriers between curriculum areas? 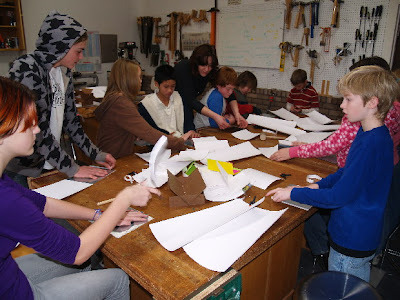 How do you get the Science, History and Woodwork teacher sharing ideas and working together? What model or method do you use at your school that works?" My program was designed from the outset for the purpose of integration, so it has been known by all the teaching staff what the purpose is, though it took some time for it to be accepted by some. Because my program has been supported from the beginning by a foundation grant that provides my salary, and some funding for material expense and overhead, it has had unquestioned administrative and board support. The other thing that I think has helped has been that I keep the teachers engaged by implementing projects that they have suggested, so they see the integration from their end, as well as mine. The teachers like very much to see their ideas take place in the wood shop. For instance last year the science teacher was wanting to build a table of elements, so we collaborated on the design and worked with the students. On the other hand, I always ask what the teachers are studying at any given time. By knowing what they are up to, I can make suggestions based on what I am interested in. 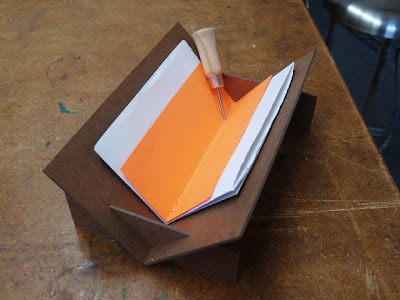 For example the book binding was a project I was interested in but because the students are preparing to go on trips in April, making trip journals was an informed suggestion I made. This last week my first grade teacher told me that they are at the point in math lessons that the kids needed to make abacuses, which was a project we had done before. Next week the first grade teacher will be introducing cursive writing, so carving pens will be the lesson. 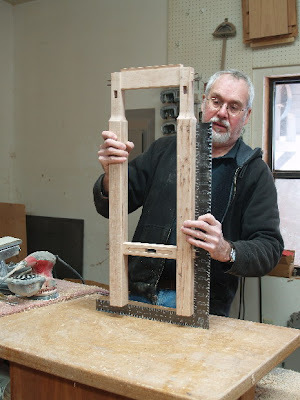 By concentrating on "tools" useful for engaging the hands in study outside wood shop, or even at home, we build the scaffolding described by Bruner. Part of what I saw early on was that because I couldn't automatically expect others to understand the value of woodworking, I would have to prove it to them by having my program serve their "needs." I mentioned this to teachers in Sweden and they thought that I was overly subservient and failing to put forth the importance of my separate discipline. But my point was not the establishment of a separate discipline. By making woodworking central rather than a sideline, made it of even greater importance than others would have been willing to allow. This approach was based on a Chinese saying, that, "If you want to lead, you must first serve." I am a remaining American craftsman. I won't say the last, as there are others like me, and will be more to come, as the urge to create objects of useful beauty with one's own hands is rooted at the core of our humanity. Today the snow is falling fast and hard in Northwest Arkansas. We started with a layer of ice, then sleet and now snow at 4 inches and deepening by the hour, so town is slowed to a crawl, and other than a bit of tractor time to clear the road, the day portends such pleasantries as a warm fire in the wood shop and the careful assembly of fitted parts. 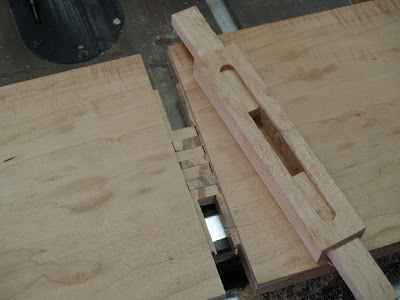 The photos show wedging the tenons that secure the table legs. I use a dowel between the mallet and the wedge to better direct the force and prevent the mallet striking from breaking the wedge. 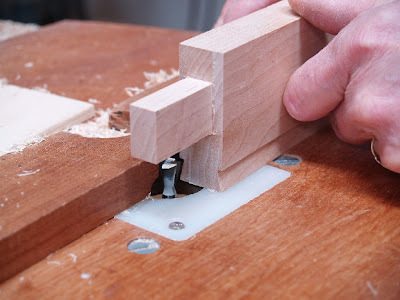 The tenons are glued and then a bit of glue spread on the face of the wedges glues them in place as they expand the tenon tightly in the mortise. One must check to make sure that the part assembly is square. After the glue sets, it would be nearly impossible to fix poorly aligned parts. I have been reading works that are influenced by Jerome Bruner. His work at Harvard laid the foundation for Project Zero which works in the area of arts and cognition, and his name came up in conversation with a friend. One of the things I have mentioned in the blog before is that narrative takes many forms and that the work of a craftsman is to describe his or her universe. Our narration may take place in strokes of the plane creating texture rather than text. It may not be readily understood by those inexperienced or illiterate in the methods and motives of hands-on craftsmanship, yet to create is a narrative act, often more responsive, responsible, truthful and expressive than words alone. Interestingly our hands-on narrative even more than written text is responsible for the warp and woof of human culture. Literacy of words and language is regarded as being of greater importance and intelligence than "literacy" of the expressive hand. The Narrative Construction of Reality, by Jerome Bruner is an important paper published in Critical Inquiry, 1991. The problem here is not that artists don't understand academics, but that some academics do not understand the arts. Speak for the arts. Demand that they be offered to your children. Practice them in your home and with your children and grandchildren. The table I'm making requires walnut wedges to lock the through tenons in place. So, I plane wood to the thickness of the tenons, then cut wide sections the same length as the tenons. 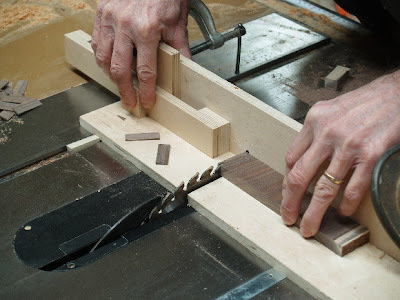 Using the miter gauge set up as shown and with a stop block to control the thickness of the wedges, I cut one after another, flipping the stock over with each cut to achieve the correct taper. This special fence clamped to the miter gauge gives support to the cut similar to what a table saw sled would provide, but allows me to adjust the angle of the cut. The sliding stop block is used to position the stock and is then slid out of the way to keep from trapping the material against the blade. 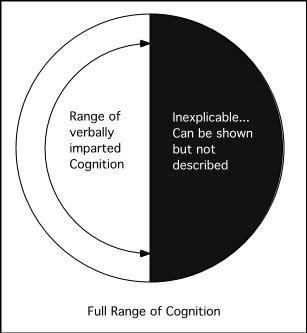 While doing is a cognitive act, thinking is not an act on its own. Do I really need to explain something so obvious? Thinking without doing, mires one in a state of interminable unresolved hypothesis. If we value skill, a nation of production and service, then we have created the wrong schools for that purpose. In order to serve a far more noble purpose,and provide education with greater meaning for children and teachers, our schools must become studios for the arts and laboratories for the sciences. Most interesting and compelling is the way the hands integrate and energize the mind, leading children into far greater academic interest and understanding. The chart at left shows the relationship between that which can be known and that which can be successfully described. Often the arts are what fit in the section at right. Proportions are not proposed as exact. An interesting statistic to watch is the remediation rate, which tells whether or not students are prepared for college. In Arkansas this year, the remediation rate rose by 3% to 54.6% which means that well over half of Arkansas' graduating seniors who enter college require special non-credit remedial classes to prepare for college level work. Some schools of course do a better job than others. But worsening performance should help to indicate that we are on the wrong course. I believe it is a matter of the hands. Research has shown that we learn more quickly, we learn effectively, and we retain learning longer when we learn hands-on. Teaching to the test is not working. Allowing our children to spend over 55 hours per week plugged into technology is not preparing them to be responsible citizens or productive workers and it is not preparing them for higher education. This morning the Clear Spring School first grade students made hand held abacus. They are working on their numbers and beginning to move naturally from finger counting and counting of objects to abstract representation of numbers. 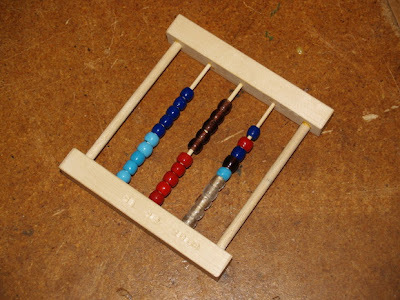 This can be helped with a simple hand held abacus. This afternoon, the 2nd and 3rd grade students and I built their puppet stage in the classroom. It won't be completed until the curtain is sewn, but today we built the stage and added closet rods to support curtains and the cover they hide behind for performances. The children have made puppets and are ready to begin writing and practicing plays. We have two lenses through which to examine American education, two vantage points from which to examine a complex mechanism and from which to chart its course. The first is that of statistical comparison, the method of standardized testing that has become so dominant. Teaching to the test became the norm during No Child Left Behind Legislation, and testing continues to serve as the core for competition in the new administration's "Race for the Top." Every public school is required by state and federal law to evaluate its students and teachers using standardized testing, and standardized testing has become the primary tool for college entrance in the US. So, throughout the US high school juniors and seniors are taking and retaking the SAT and ACT exams hoping to raise their scores and raise their chances for admission to their schools of choice. This lens or vantage point is widely considered the most intelligent one because it is so abstract and difficult to understand. Can you explain standard of deviation? Maybe so, but understanding test scores and their applicability is an arcane science about which most American have very little understanding. So it must be very smart, right? Those tests were made up by some of the smartest (narrow) minds in America, and who can argue with that? The other lens is one of common sense, and common observation, time spent in the classroom or in life, watching children learn and grow. Since Comenius (and before), educators have observed children learning and at play and attempted to better understand how to best create school environments to make productive use of children's most natural inclinations. From this vantage point, all who have been students in schools, had children in schools, have a level of expertise based on their own successes, or failures that could be drawn upon to recast American education as more effective and meaningful for our children. That might sound very scary to school administrators and public policy impresarios. A whole populace of concerned individuals each feeling he or she has something important to contribute to the debate? A scary notion, perhaps, but our literacy was greater in the US during the age of the one-room school house, and before the rise of standardized testing. It is ironic that the PISA test which measures 8th grade school success in reading, math, scientific literacy and other subjects has called international attention to Finland, the world's leader in education. We are below average among developed countries. In Finland, where educational sloyd began, and where kindergarten students do woodworking, they roughly ignore testing and feed learning instead. Their children thus benefit from the world's best education while we keep testing and failing to catch up. And so, the idea I propose is not that we completely abandon testing. It can be useful. But can we at least restore an appreciation for those masters of education who came before testing became the dominant force in American education? Just read a bit of Comenius. Think about the impact of Froebel. Explore the wood shop as envisioned by Salomon and Cygnaeus. Begin wondering how to get multiple intelligences and the arts back in schools. Get your hands on American education, recognize the value of your own expertise and bring schooling back into intelligent focus. The detached view long distance view offered by standardized testing misses the close-up... It misses where the rubber meets the road, where teachers meet students and parents, and the expertise of each might be contributory to better education. In fact, I believe a school recast on the foundation of common sense would come close to what Comenius, Froebel, Montessori and Dewey proposed in the earlier days of progressive education. 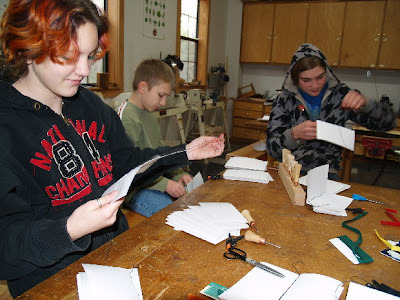 Today in the CSS woodshop, the 7th, 8th and 9th grade students continued book binding as shown above. We had to go back and redo a few things. Next week we start making covers. I often ask my students about how the project we are working on fits the level of difficulty required for their growth. I ask, "Is this too hard for anyone? Is it too easy?" And while I can usually answer those questions on my own by observing their progress in woodshop, it is important that they reflect on the questions themselves. In my close of class conversation with the 4th grade class today, they told me that they like difficult, challenging projects. They told me that they also like things that they can be successful doing. So I asked what the teacher's job in all that might be. "To present challenges that are at the right level for them to succeed and grow," they agreed. And they also want things to be fun and that they can work on projects that interest them. If things are too easy, they are boring. The photos above are of 4th, 5th and 6th grade book binding. In classes full of 20 or 30 students do we find time available for students to develop scientific reasoning? It can happen quietly in a wood shop, but when we have that many kids in a class, it takes courage to raise your hand and guess the answer the teacher has in mind, knowing of course that you may be wrong and face embarrassment for your "wrong" answer. We thus discourage what William Whewell described as "bold guessing,"
Bold Guessing. -- Advances in knowledge are not commonly made without the previous exercise of some boldness and license in guessing. The discovery of new truths, requires, undoubtedly, minds careful and scrupulous in examining what is suggested, but it requires, no less, such as are quick and fertile in suggesting. What is invention except the talent of rapidly calling before us many possibilities and selecting the appropriate one? 1. Bold Guessing, as described above. 2. Erroneous guessing -- recognizing "All who discover truths must have reasoned upon many errors to obtain each truth." 3. Skill in devising means of testing the truth of guesses. 4. Willingness to abandon an erroneous guess or untenable hypothesis as soon as it is recognized. 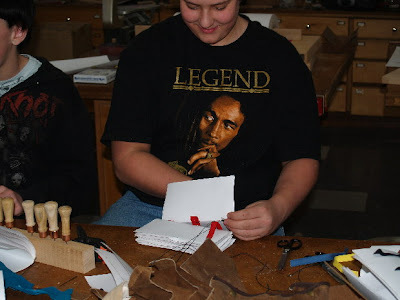 These are the kinds of lessons we learn when we have woodworking, crafts, the arts, and laboratory science as the center of the educational process... where students learn by doing in a project based learning environment... But that we won't get by sitting quietly at your desk or on your hands. And so, if our purpose is to develop complaisant conformity in support the consumer economy, we have the perfect educational model. If we want to develop students for creativity and problem solving as will be required by the future we face, we need to make a few changes. Richard Whitmire has an article the Lost Boys in the Wall Street Journal pointing out the discrimination against young women that takes place regularly as universities try to attain gender balance by admitting boys of lower academic standing... the result of under achieving and under motivated young men produced by our current model of education. Richard Whitmire is the author of a forthcoming book, Why Boys Fail. When Ted Sizer, author of the classic "Horace's Compromise" was describing a school responsive to each child's needs, a principal noted, "That will be very messy." Ted responded, "Yes it will. Learning is messy." And so, I would personally suggest we just get over it and make allowances for a good dose of messy in today's classrooms and schools, nothing of course that a good clean-up at the end of the class won't fix. Creativity involves taking things apart... Cutting things into pieces... Making things... Learning from real life... Spilling glue and paint... Kids get dirty... They make noise... The desks are in the way of working sprawled on the floor and must be moved. There is a natural administrative resistance to noise and disorder, and yet it is through chaos that the opportunities for problems solving behavior enter the classroom, and through which problem solving skills form roots in the lives of children. I am reminded of my friend Zeek's very first day teaching high school art class and his principal's words before students arrived, "Keep your students quiet. Don't let them make a mess." I am also reminded of the artist who told me of giving tools to her grandson, but having them refused by the child's mother. "He would make a mess." I am also reminded of Bob Dylan who when asked about the length of his hair replied, "We all have hair the same length, but some have it growing on the inside where it fuzzies their thinking." Can it be that we all live within the balance of chaos and order but that for some the chaos is in their brains where it fuzzies their thinking? You've heard the term hair-brained? Perhaps it is most fitting to those who have no understanding of children and would screw desks to the floor, and expect children despite their most natural inclinations to be quiet, and thus miss the opportunity to use those most natural inclinations to the best educational advantage. We have choices to make in the education of our children. What is our level of tolerance for the things that make messes... like wood working for instance? What is our level of tolerance for things that make noise... like wood working for instance? There are forms of education that are quiet and orderly and remarkably ineffective considering the huge investment we have made in them. And then there is learning. It is messy, it is noisy and it is exciting. Exciting enough for example that it makes kids excited to be in school. Exciting enough that they are motivated to keep on learning long after the school doors close for the night, and long after they have outgrown the school and have gone on to follow independent lifelong learning passions of their own. 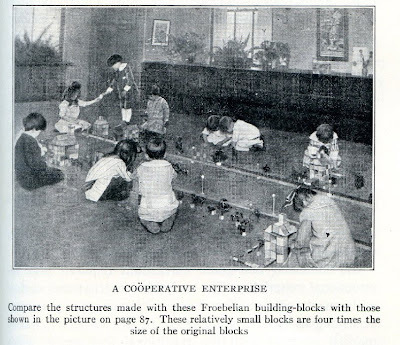 The photo above shows Kindergarten students playing with Froebel blocks, making a mess, but building their own orderly city. The experts from the University of Chicago believed that their own larger blocks were better suited to the children's work, though it appears these kids are doing just fine. We learn about weight, density, mass, texture, temperature, hardness, scale and balance from the hands-on manipulation of real materials and objects. As soon as these attributes are no longer relevant to the human condition, hands-on learning will no longer be necessary except as a means through which to develop conceptual models of abstract concepts. Sliding dovetails provide the opportunity for wood to expand and contract through changes in atmospheric humidity without affecting the structure of the piece. They are also useful when you want to make a piece of furniture without using metal fasteners... where you are purely reliant on craftsmanship for the integrity of the work. 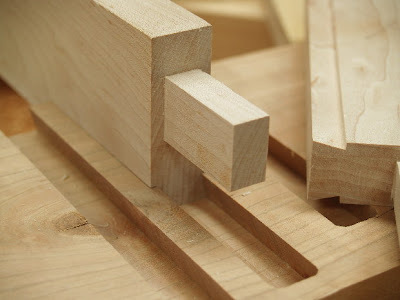 These photos show sliding dovetails formed using the router. 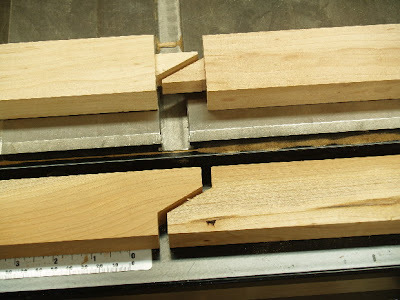 The piece of cherry shown in the second photo is a test piece used to determine the perfect router depth. I make a log cabin jig to guide the travel of the router. Then with the same router and bit mounted in the router table, I shape the edges of the table stretchers to fit in the dovetail grooves which will be cut later in the underside of the top. The Cherry test piece will be kept to serve as the very necessary depth guide until that operation is complete. Modern adolescents are not content with a passive role. They exhibit this discontent by their involvement in positive activities, activities which they can call their own: athletics, school newspapers, drama clubs, social affairs, and dates. But classroom activities are hardly of this sort. They are prescribed "exercises," "assignments," tests," to be done and handed in at a teacher's command. They require not creativity but conformity, not originality and devotion, but attention and obedience. Because they are exercises prescribed for all, they do not allow the opportunity for passionate devotion, such as some teenagers show to popular music, causes, or athletics. Can we create schools in which students natural inclinations and passions are put to work? The passage above describes one aspect of motivation, that of ownership. Kids like to do things that define themselves as unique, that set them apart and express some level of autonomy, worked-for success and earned trust. Most are wise enough to know that success that comes too easily has little meaning. Working hard for something provides a sense of ownership, a sense of pride. Are teachers and adults any different from students in these regards? If we want creative students can we make them so by failing to trust teachers with the opportunity to take risks and be creative as well? My wood shop classes are often a risk, a gamble. I learn new things and I am grateful for the opportunity that some teachers may not have. So, how do we fix things? Will testing teacher performance do it? Can holding them accountable for the delivery of canned curriculum do it? Can we raise teacher performance in other ways? What if we were to treat teachers with greater dignity and respect in the first place, trusting their creative capacities and the nobility of their motivation? That is the very special gift I receive in teaching at the Clear Spring School. The Finnish educator's response to a question about standards applies to both students and teachers. "If we want the elephant to grow, we don't weigh it, we feed it." If we want teachers to grow, is feeding them money enough? Or should we add to the diet, dignity, trust, and a creative environment in which failure is an expected point on the path toward success? 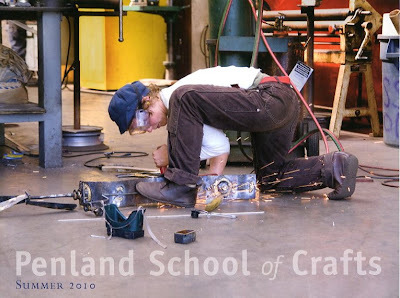 The photo above is the cover of Penland's Summer catalogue, showing intensity of learning, and what nearly every high school student in America would prefer to study hall. You can find classes to fit your interests and aspirations at the Penland School of Craft. Each and every person who has at some point attended school has some expertise in its success, its effects, and its failings. We have placed too much emphasis on statistical frameworks constructed of abstract data, while real learning is built on the foundation of experience... personal experience. Until we have called upon students, teachers, administrators, parents, and politicians to confidently explore their own very personal experiences in the classroom and to judge for themselves the effect, we will be diddling away the hours, dooming our children to boredom and preventing their greatest success. If you think brains in the beltway will come up with new plans for the necessary revolution in education you may just as well forget about it. They've been thinking about it for a long. It will take hands-on expertise expressed through hands-on teaching to do the job. 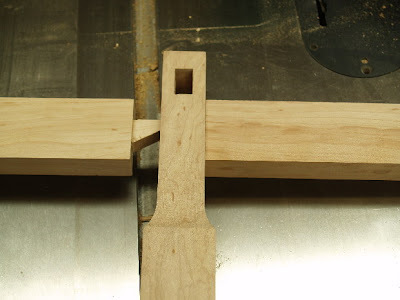 Today in the wood shop, I am joining parts using yet another interesting mortise and tenon joinery technique. The photo above shows the joint in process. 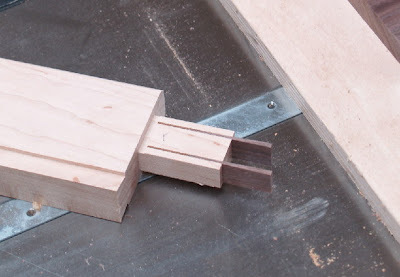 The stop block clamped to the sled controls the position of the tenon as it is cut. You can see in the photo below, two more steps. 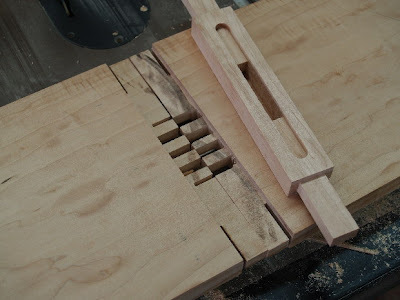 In the first the interlocking finger joints of the tenons are cut. In the second, I used the band saw to cut away waste, allowing the two tenons to join from both sides of the mortised piece shown. Ted Sizer wrote the 1984 educational classic, Horace's Dilemma, which explored the American high school. It seems that despite the very best intentions and efforts of high school teachers, administrators and communities, little change has come in the last 25 years since Sizer's book was first published. While schools wrestle with the challenge of imparting measurable knowledge, it seems the important thing is not knowledge but skill. "Schools that always insist on the right answer with no concern as to how a student reaches it, smother the student's efforts to become an effective intuitive thinker. A person who is groping to understand and is on a fruitful but somewhat misdirected track, needs to learn how to redirect his thoughts and to try a parallel but somewhat different scheme. Simply telling that person that he is wrong throws away the opportunity to engage him in questions about his logic and approach. Well-directed questions by teachers can promote ever more effective intuition, albeit often by a process that is difficult to ascertain. Nonetheless, like aspirin whose precise functioning we do not understand, it works. "Schools value strictly orderly thinking. The computer, with its special form of algorithmic "reasoning," reinforces this predilection. Some adults in schools dismiss all other kinds of thinking as playing around making mudpies. For them, intuition and imagination are not really serious pursuits. The trial-and-error procedures involved are too messy. accordingly, they get short shrift in far too many schools, with sad costs to the individuals and their communities. "In sum, these skills--reading, writing, speaking, listening, measuring, estimating, calculating, seeing--an the basic modes of imagining and of reasoning should be at the core of high school work. They should pervade all subjects offered and be visibly and reviewably part of the school program." Sizer goes on to point out that the most effective teaching is in the form of coaching. 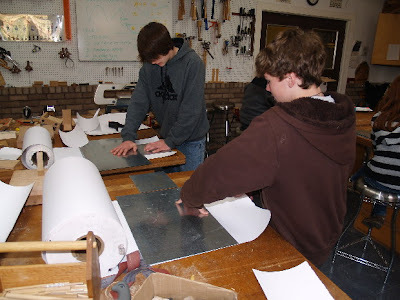 It is a lot like what happens in shop class or on the athletic field. 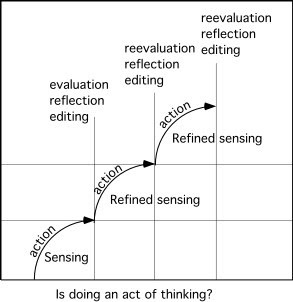 The student must have a foundation for what he or she learns through doing, through action. An effective coach offers encouragement and guidance through which real skill is lifted to a higher level. If we want education to blossom in America, and I believe we deserve it, we will place the arts (including woodshop) as central to education, making the entire education of our students "hands-on." While some as Sizer suggests, will think it messy, do we prefer to waste our time, teaching, and money on something that just won't work? ...that is near guaranteed to not work for most students in the first place? In other words, what is the good of knowing stuff if we know how to do diddly squat? Most readers I'm sure are familiar with the concept "opportunity cost." Opportunity cost is the value of the next-best choice available to someone who has picked between several mutually exclusive choices. It is a key concept in economics. In essence, it is what we have given up in order to get what we have and it could be described as the road not taken. In economics it is about how we spend our money, but of course it really concerns a great deal more, the ways in which we discover depth of meaning in our lives. In the examination of opportunity cost, we are challenged to become intellectually engaged in the examination of what we do, rather than simply allowing ourselves to be blindly led. And so what is the opportunity cost of all this wondrous technology? Ear buds with music streaming between ears, through the brain. Fingers and thumbs on powerful tiny keyboards streaming instant messages to friends. Children feeling important and connected by the constant interruption of tones that announce the arrival of some new bit of un-repressed chit-chat from friends compelled to share 160 characters of unedited cryptic monologue? Are we missing out on a richly textured inner life in which thoughts are carefully refined and organized, edited before being expressed? Are we missing the wonders of listening to where we are, to the people we are with, to the sounds of nature of which we were once a part but from which we are now estranged? In schools children now arrive knowing little about working with their hands except on the hand-held devices that have become the ubiquitous requirement of youth. As exciting and wonderful as these objects are they must also be understood as the absence of scissors, the absence of string... the absence of wood and saws, and pocket knives and skill in their use. If the things in our museums are to be honored by future generations, will they be understood by those who have little sense of their own creative powers? By those who have spent little time in quiet reflection and know little about the making of things? And so, I ask, can we take both roads, not forsaking one for the other? Can we gain a sense of reason and reasonableness in our use of technology? Some parents are taking away the hand held devices at night so that children at least have the opportunity to sleep uninterrupted, and perchance dream. Perhaps in dreaming they will come to wonder about the making of things, and think about the creative powers they have neglected to form. And as parents and grandparents, and as teachers, we should be talking about this and putting real tools in the hands of our children. This afternoon I have been working on a table with spalted walnut top and sugar maple legs and stretchers. It is made entirely with woods from Arkansas... An important consideration to some. 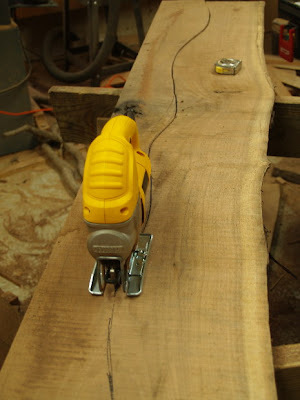 The meandering line in the board for the top will allow the wide stock to pass through the planer. It also provides an opportunity to deal creatively with defects, and will allow the two parts of the table top to be secured with sliding dovetails, so that when the table is complete, there will be no man-made fasteners... With the exception of metal glides, it will be all wood. In terms of opportunity costs, I could have chosen many other techniques in the making of this piece. But the road less traveled offers benefits known only to those turning down the forested path. 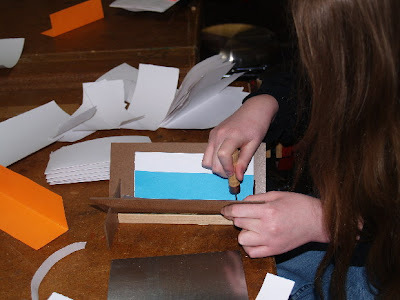 The 4th, 5th and 6th grades worked on making journals for their spring travels, and the first through 3rd grade students have been enjoying a free day to make whatever they want. Next week they will return to more structured activities. I got a copy of American Woodworker, #146 Feb/March 2010 in the mail today that has two of my articles in it. One is making the world's easiest router table and the other the use of the Gifkins jig in making boxes. This copy of the magazine will be on the news stands soon. An average of 2,272 text messages per month were sent by American teens in the 4th quarter of 2008. The number per month increased in 2009 and will again in 2010. In the last five years, teen use of media increased from 8.5 hours per day to 11. Do children stay up all night for that? When my wife and I go to the movies, the big advertisements leading up to the movie are for the armed forces. The images are of young people doing real things that demonstrate strength of character and commitment to nation and community. The images on screen show young people becoming a part of something larger than life, larger than self. So, what can you say in 2,272 text messages per month? By the time kids hit their 21st birthdays, many will have composed thousands of pages of text, but will any of it be meaningful to others or even to themselves? And so the question becomes, how and why have we taken the natural human passion to engage in things larger than self, and so effectively squandered it on such drivel. Do we have a responsibility to ask more of ourselves and our children than that? Aren't we just all a twitter for the answer? Apparently not. 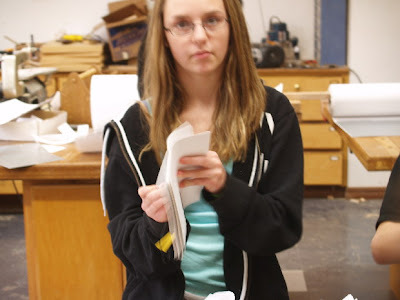 Today in the wood shop, 4th 5th and 6th grade students will begin making books. I've worked the kinks out of tearing paper, and have torn lots of paper in preparation for today's class. Wish me luck. Some students will find it particularly challenging, but when I ask whether they would prefer easy work or hard, guess what they say? I am amazed sometimes that when I demonstrate things, methods, objects, to my students at school, they don't see the whole thing at once. So today we began stitching the bindings of our books. First, of course there was a flurry of folding papers. The paper as it comes off the roll has a natural curl to it that is deceiving. Your eyes tell you it should fold one way, but the fibers in the paper and their alignment requires that it be folded the other for best results. This takes very close observation to see. This takes very careful explanation to impart, and when your mind is full of your own thoughts, it is hard to listen with complete attention. We miss way too much. And so it is in schools. It can take the engagement of the hands to learn the lessons. With the engagement of the hands, the mind and heart follow. And of course, if you were to read this from the standpoint of academic/scientific precision of language you would stand back in critical judgment, while those who work with their hands will know exactly what I'm talking about. So it was with the teachings of Friedrich Froebel. As a patient teacher, I bide my time. I explain things, then allow the students to get the materials in their own hands and proceed to the point where their understanding runs out, and I explain again. They get more the second time when they stand on the platform of their own experience. In the photos above, students are tearing, punching with an awl, and beginning to sew. And I will also explain that one's best work is often not one's first work. We see more as we progress, and if a craftsman's will is at work, what we do in time is lifted to the level of "art craft"... art in which deep development of character is expressed. Can human qualities mirror the crystalline forms that Froebel handled in the Mineralogical Museum? Froebel was inspired to believe that could happen. I think of it as craftsmanship... the process through which one grows to meet full human potential. This somewhat mystical approach to objects and their effects were a major cause of disdain that many educators felt toward Friedrich Froebel and his kindergarten method. But if you are hands-on yourself, you might feel some kinship with Froebel and might have hands and fingers sensitive and integrated well enough to provide greater insight than what some might have. You can learn more about Froebel's use of crystalography in his plans for transforming education from Bart Kahr's article Crystal Engineering in Kindergarten. Many of my readers will already know of the relationship between Kindergarten, its theory and methods, and the development of the manual training movement. The power of objects to engage and transform, to shape the human intellect, has largely been forgotten as an educational method. What we put in our children's hands at too young an age steal the thunder from simple things like blocks and string. But with the application of wisdom, it is something we can fix. *discover by careful observation or scrutiny. 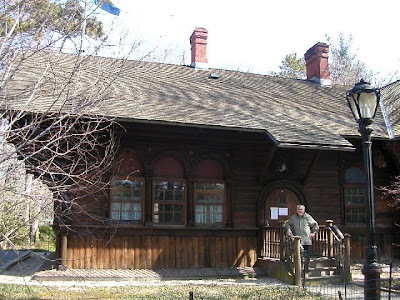 The Swedish Marionette Theater in Central Park, New York, was originally built as a typical Swedish School house for display at the Philadelphia Centennial Exposition. Park Designer Frederick Law Olmstead had the cottage moved from Philadelphia to the park where it served for a time as a tool house before becoming the Marionette Theater. I am trying no to determine whether Otto Salomon's Sloyd models were part of the exhibit shown in the school house when it was in Philadelphia. If so, it would prove that both Educational Sloyd and Victor Della Vos' Russian system were introduced to an American audience in the same year, 1876. A photo by Henry Leutwyler in Time Magazine this week shows the relationship between the hands and the understanding of abstract concepts. 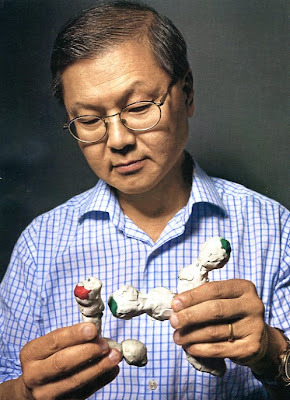 Aids researcher David Ho is shown with a clay model of the antibody that he believes may prevent HIV infection. Craftsmen and scientists routinely use hand held models to understand things that the mind alone could not grasp. Would this model in his hands have greater use than one created and manipulated on a computer screen? What do you think? I will let you inform me. But there is a clear relationship between grasping concepts and ideas and what we do with our hands. Still the hands only at the risk of stifling intellect, and it is what we often do in American education. What value do you suspect Thomas Jefferson would have placed on the education of our children's hands? "From this school I was removed to another, Madame Tileston's, ... where I was taught elementary reading and spelling, after the same ancestral fashion; that is, I received about twenty minutes of instruction each half day, and as school was kept three hundred and sixty minutes daily, I had the privilege of forty minutes' worth of teaching and three hundred and twenty minutes' worth of sitting still (if I could) which I could not -- playing, whispering and general waste of time, though occasionally a picture book relieved the dreary monotony. "My dislike of confinement at busy nothingness, love of mischief, [etc.]... often entitled me to Madame Tileston's customary punishment of sundry smart taps on the head with the middle finger of her right hand; -- said finger being armed with a large and rough steel thimble." The Kindergarten presented a revolution in education, even among those who understood very little of its method or intention. There was a gentleness in it, and a respect for children and their innate qualities. And so, schools became less harsh for a time, more loving, more colorful and more accommodating of children's natural inclinations. 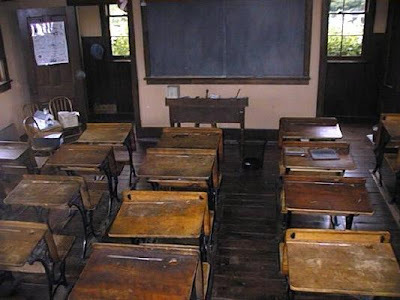 In most classrooms as in this one from 1872, desks were screwed down eliminating any possibility that the classroom could be used for anything but desk work. This presented a challenge to teachers wanting a more responsive and active program. So, some teachers wanting to adopt more modern methods sought permission to unscrew and remove the fixed desks and replace them with more flexible furnishings. "Roused from perfect apathy, the boy cast about the schoolroom an eye wearied to nausea by the perpetual vision of the neat teacher on the platform, the backs of the heads of the pupils in front of him, and the monotonous stretches of blackboard, threateningly defaced by arithmetical formula; and other insignia of torture. Above the blackboard, the walls of the high room were of white, plaster-white with the qualified whiteness of old snow in a soft-coal town. This dismal expanse was broken by four lithographic portraits, votive offerings of a thoughtful publisher. The portraits were of good and great men, kind men, men who loved children. Their faces were noble and benevolent. But the lithographs offered the only rest for the eyes of children fatigued by the everlasting sameness of the schoolroom. Long day after long day, interminable week in and interminable week out, vast month on vast month, the pupils sat with those four portraits beaming kindness down upon them... Never, while the children of that schoolroom lived, would they be able to forget one detail of the four lithographs; the hand of Longfellow was fixed, for them, forever in his beard. And by a simple and unconscious association of ideas, Penrod Schofield was accumulating an antipathy for the gentle Longfellow and for James Russell Lowell and for Oliver Wendell Holmes and for John Greenleaf Whittier, which would never permit him to peruse a work of one of those great New Englanders without a feeling of personal resentment." I would be interested in knowing how my readers feel about these two accounts. Can you relate to what these writers observed in their classrooms? Has American education improved as much as we would hope over these two descriptions, each one hundred years apart? From my own schooling in the 1950's, I can relate. The Philadelphia Centennial exposition, 1876, ten years after the close of the American Civil War, and during the second term of President Ulysses S. Grant was intended to celebrate the centennial of the Declaration of Independence in the city of our nation’s birth. It also charted the course for rapid American industrial expansion. 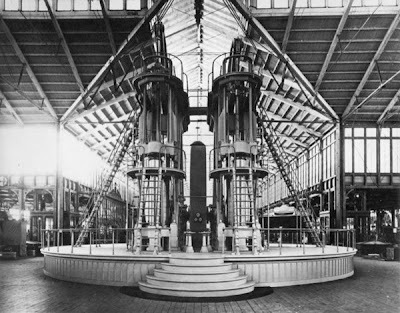 In the great hall of industry, visited by many thousands, a single huge Corliss Steam engine ran 13 acres of through more than a mile of shafts. The engine had a 44 inch bore, 10 foot stroke, was more than 45 feet tall, had a fifty-six ton, thirty foot diameter, twenty-four inch face flywheel, and produced 1,400 Horse Power at 36 RPM. But the introduction of modern industry was not the only lasting effect of the exhibition. Two particular educational methods went from obscurity to mainstream. Victor Dela Vos display of the “Russian System” of manual training showed how schools might prepare students for futures in the industrial age. Calvin Woodward of Washington University and John D. Runkle of MIT were impressed, went home to their universities, established programs of manual training and thus became the co-fathers of the manual arts movement in the US. A growing industrial nation would not only need the machinery produced by Corliss and others as demonstrated in the halls of industry, it would need trained and nimble hands and minds to feed the machinery of American progress. And so we see an exposition, contrasting gentleness of learning with the explosion of American industrial power. But there was a vision that brought the two into a heartful combination. Educational sloyd. When Uno Cygnaeus developed the folk schools of Finland, based on his desire to extend Frobel’s kindergarten theories into the upper grades, craft (sloyd or käsityön) was the method through which children would continue their learning, hands on. As described by Salomon and his followers, the Russian system of Della Vos and as introduced to the American public at the Philadelphia Exposition of 1876 had economic purposes, propelling students into industrial performance, crafts and educational sloyd in schools had “formative” or developmental effects. The idea was to lead the children onward in growth of skill, character and intellect by engaging their natural love of making things. It is the difference between pushing and pulling a rope. The photos above and below: Corliss steam engine at Philadelphia Exposition, and Susan E. Blow's St. Louis classroom as displayed at the 1876 Exposition. This is a rather special mortise and tenon joint used when you need to join two tenons from opposite sides in a single mortise. You won't need this joint very often, but there are times when you may find it useful. In this case, I am joining table stretchers from opposite sides of middle legs on a six legged table. First, form the tenons on the ends of the stock. Then make a mock up of the joint using material cut to the same width as the tenoned parts. You'll find cutting the mock-up preferable to relying on measurements, as you can see exactly how the parts will fit together before running the risk of ruining real parts. I use a tenoning jig on the table saw to make the angled cut which allows the two tenons to intersect at the center of the joint. 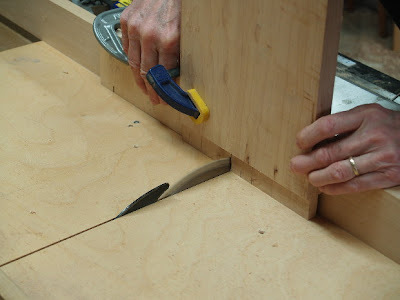 For the test make the angled cuts it just as you will the joint. The nice thing about the test cuts is that if it doesn't come out just right, adjust as needed and try again. When you get it right make the same cuts on the actual parts. 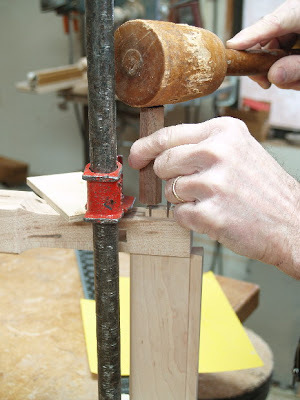 The photo below shows how the tenoned parts fit the mortise, coming in from each side. 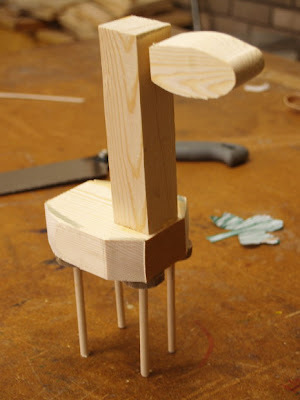 Glue will join the two tenons into a single unit. Learning paradigms... 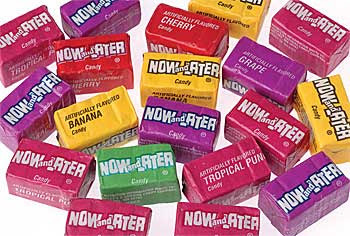 When I worked as the arts and crafts director at Porter-Leath Children's Center in Memphis, in the early 1970's the neighborhood children had a favorite candy called Now and Later. They could be purchased in a variety of flavors and came four wrapped candies in a small package for a nickel. The idea was that you could eat one and save the rest for later, or as I learned, I could eat one myself and share the rest with friends. David N. Perkins, in the foreword to the book, Studio Thinking, by Hetland, Winner, Veenema and Sheridan, describes two "learning paradigms," import and export. The idea of the export paradigm is that you learn things with the possibility or probability that you will need them later. Learning algebra is one of those things that fit the export paradigm. A student is told, you might need this some day. In fact, as pointed out by Perkins, most of modern education is based on the export paradigm as educators teach what they've been told, based on what curriculum designers and text book publishers think will be needed some day. The idea of the import paradigm is that you learn things that you need right now rather than someday or later. What Hetland, et al. have described as studio thinking, and what you do through the arts, involves learning that is required by the task immediately at hand, but that also may be useful later. In other words, Studio Thinking is the "now and later" of education. It offers something right now that may also be useful later. It illustrates the difference between pushing and pulling a rope. Actually doing something is the sweet that lures the children onward in education. So exactly how many things have you forgotten that you learned in school? There is that old saying, "use it or lose it." The truth is that in most cases if you don't use it, you just won't get it in the first place. Comprehension involves two things, gaining memory of the subject, and establishing the neural pathways through which that memory can be easily and usefully retrieved. Those important neural pathways of interconnected thoughts are less likely to develop through the export learning paradigm. For that reason, schools in order to be effective, must become laboratories and workshops to find greatest success. The crafts and art are the Now and Laters of education. They give you something for now and something for later, or you can open a pack, eat one yourself and pass the rest out to friends. My favorite is watermelon. 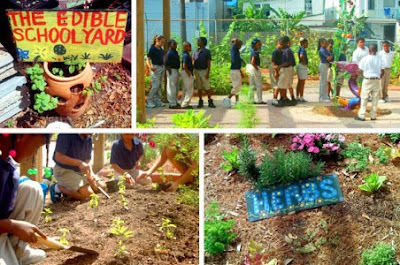 Reader Dairy State Dad sent this link to an article in Atlantic rebutting an earlier article critical of the School Yard Garden movement which puts kids to work with their hands growing food. The idea of the original article was that since there was no evidence connecting gardening with achievement on standardized testing in math, there was no point to it. In fact, it was cheating our most vulnerable students from the education required for their success. It is a clear reminder that whatever you propose, there are plenty of naysayers. One reading the interesting rebuttal should read deep into the comments left by other readers who point to the history and purpose of education and proclaim the benefits of hands on learning. The school yard garden actually got its start with Friedrich Froebel, inventor of Kindergarten. 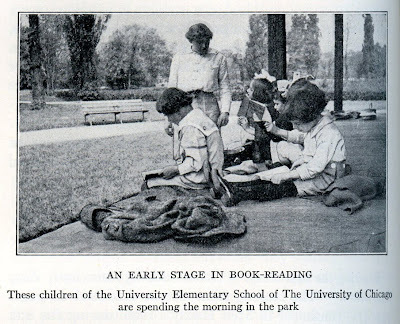 In the US, the kitchen garden movement paralleling promotion of Kindergarden was part of the foundation for manual arts training movement, having particular importance in the founding of Teachers College as part of Columbia University in New York. And in November my daughter showed me the school yard garden her gardening club planted on the Columbia University campus. Things move in cycles, are interconnected. Thanks for the links. The news and broadcast images from Haiti are so disturbing. I could hardly sleep. If anyone had thoughts that the hands were of no longer of any importance, that would have been shattered by the images of hands waving for human attention from under piles of debris or by bare hands attempting to rescue those trapped beneath collapsed buildings. I read one report of a man who whose wife had died minutes after he had dug her from the rubble of their home. His son was still trapped. He said, "I don't have tools to do so many things." There have been many barehanded rescues in Haiti, proving that with hands alone, men have power. But it is heartbreaking to see what the Haitian people have had to endure. I pray that more powerful tools arrive soon. It is heart warming to see the world's generosity in sending aid. It is disturbing to see the level of poverty that we have allowed to exist in our midst. We have had earthquakes of the same magnitude in the US with little effect. But when you take that level of force combined with substandard building practices and extreme urban congestion and poverty, you have the makings of disaster of epic proportions. What we witness now in Haiti is as much man-made as natural. In other words, with greater effort to alleviate the world's poverty, this could have been avoided. Please take time to help now with your donations, and then support long term efforts to rebuild Haiti. My show, Custom by Design has closed at the Historic Arkansas Museum, so it is time to transport my work. That means no blog post tomorrow as I will be driving all day. If you are new to the blog and are missing something new to read, type sloyd in the search box at upper left and see what turns up. If you like foreign travel, type in Sweden, Finland, or Estonia. Lots to read here if you don't mind old news. Here in Eureka Springs we will be voting in February for a tax increase to build a new high school. I believe this could be the opportunity to not only get a new building, but to develop a new high school culture, one more effective for learning. That requires the engagement of the hands... studios, workshops and laboratories. So the following is my letter of support, sent to our county newspapers for publication. The arts are the most certain way to engage children in a love of learning. As a long time artist in Eureka Springs, I want to share with you my intention to vote for the increased millage to support a new high school. We currently have a much better than average high school in a less than average facility. I believe that the new facility will be a chance to bring the school culture much closer to the arts and offer a once in a lifetime opportunity to bring the arts to the center of the high school experience. We learn things from the arts that can’t be found on multiple-choice examinations. While most of the world is teaching to the test, the arts present the opportunity to do and learn so much more. And so, I urge my fellow artists to vote with me. And then to hold a vision for our future. A school can be as much laboratory/workshop/studio as lecture hall, and indeed must be if it is to be as effective as our children deserve. I sincerely hope we will all vote for the arts. A child must go on learning to coordinate, with more and more skill, his muscular movements if his body is to be developed to the highest standards of health and efficiency; and nothing contributes to this better than the controlled and rather delicate motions necessary for making things with the hands. The fact that he is making things gives just the stimulus the child needs to enable him to keep on at the task, to repeat over and over the same efforts of mind, hand and eye, to give him real control of himself in the process. The benefits of handwork on the utilitarian side are just as great. The child learns how to use the ordinary tools of life -- the scissors, knife, needle, plane, and saw -- and gets an appreciation of the artist's tools, paint and clay, which lasts the rest of his life. It he is a child with initiative and inventiveness, he finds a natural and pleasant outlet for his energies. If he is dreamy and impractical he learns a respect for manual work, and gains something toward becoming a well-rounded human being. These days, many children are introduced to computers, operating keyboard and mouse and skip over all the essential creative tools that pre-school students would have used in the past. So they come to school not knowing the basics of creativity. Some come to school never having used scissors. Teach first things first. Start with tools that allow the children to witness and understand the means through which their efforts are applied to the material. Start with tools that provide hands-on sensory feedback as to the structure, and density and tactile qualities of the materials. Through the hands-on manipulation and exploration of materials, the entire thrust of scientific exploration is recreated within their grasp (literally and metaphorically). Computers and electronic technology and their abstract representations of reality can wait. 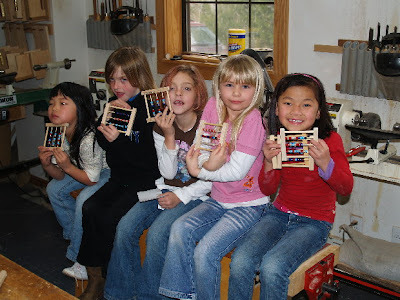 One of the things the children love most is having a free day in wood shop, in which they make whatever they want. So I collect interesting scraps and they use their imaginations. They also have to describe to me the kinds of things they need to keep up their creative flow, and it is a test for me to keep up. You can see that what we get is not always quality work. And prototypes and inventive processes are where we learn what works, not how to create perfect quality. 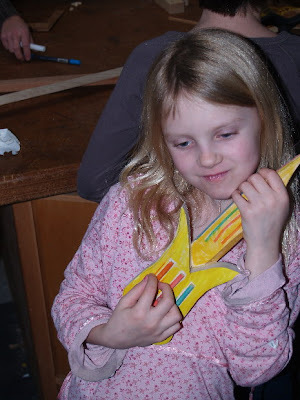 As a fellow woodworking teacher, do you have any advice on walking the line between demanding "quality", instilling what quality is, and letting kids be happy with a mediocre project that they are proud of? As much as I'd like all of their projects to glimmer like jewels, sometimes they are less than stellar. Otto Salomon called what you are asking about "educational tact." How does a teacher know when a kid has done well enough? It is hard to know. As a professional, I know how high standards can go, but I also know that kids are not ready to do that level of work. A friend of mine, Glen had a dad who did woodworking and there was nothing Glen could do in the woodshop that met his father's high standards. And so, while Glen would have enjoyed woodworking and told me so, he knew he could never do it... His father had destroyed it for him. So it is important to not crush creative spirit. We don't start out doing quality work. But if we are exposed to it and receive encouragement toward it, it may come in time. It helps when you have experience across a few grade levels. You see that the evolution in what a kid sees and is capable of doing takes place over time. Some are primarily visual, and some tactile or haptic. Each will be looking for different values in the work. I had one student tell me, that's good enough, its for my mother... a very realistic assessment knowing that mothers will stoop pretty low in acceptance of things made by kids. But the question is interesting. Do you want to give your mother your best, or just what she will accept? So I asked the question but let the kid choose the answer. It wasn't what I would have preferred, but if I got him to think about then I did him a favor. I tried self rating with a finished example that I said was graded as an A. it didn't work. I thought about making additional models with flaws equal to a B, a c, etc. Peer grading was an utter disaster. What I finally did was always had a project I was working on at my bench and they could see what standard I held myself to. I asked them "If I did this would I be happy with it?" Not a perfect solution but, a workable one. I had a pottery teacher who did his work in the same studio as the students. We were in awe of his creativity. His workmanship was an inspiration. My students know too little about the standards I set for my own work, except that they see it at various shows around town. As I mentioned to Joe, you can't push a rope. It is far better to lead by example. 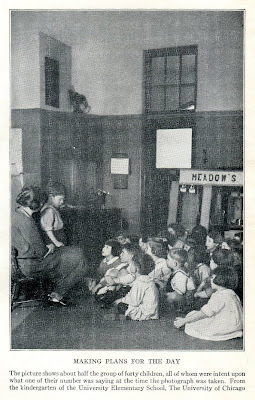 A striking feature of the movement to establish kindergartens in America was the enthusiasm of its proponents--their intense interest and belief in its values and possibilities. We may note briefly four reasons for this enthusiasm; namely, (1) the natural interest, particularly of women, in happy expressions of child life; (2) the philanthropic interest in relieving suffering and in increasing happiness; (3) the practical, usable system of materials, games, songs, etc; (4) the interest in a mystical cult with a more or less meaningless, incomprehensible language and ritual. And so you can see both sides in a nutshell. Good, Good, Good, but the academic elite wondered why the educational method couldn't be described in plain, precise language that a scientist might use? Symbolism was a bit too much. The Rudolf Steiner Waldorf schools have faced the same challenge. A viewer might like what she sees in the classroom, but what's this anthroposophy stuff? That word isn't even in spellcheck!!! And so, human beings attempting to explain the inexplicable often resort to language that is more symbolic than precise. It is the same with everything we are just learning. When I learn something new in the woodshop, it can be very difficult to explain to others what I am doing, but lack of adequate explanation is not cause for denying the validity of my efforts. 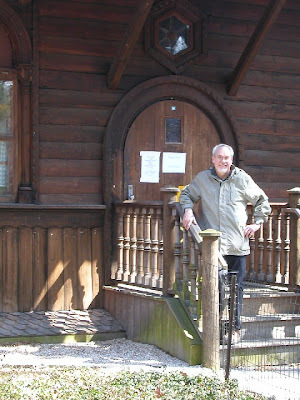 "The enclosure for visitors was always crowded, many of the on lookers being hewers of wood and drawers of water who were attracted by the sweet singing and spell bound by the lovely spectacle." 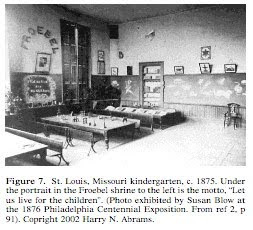 "High-sounding Froebelian symbolism kept kindergarten isolated. -- Froebel himself was an expert in this sort of mystical juggling of words...."
Friedrich Froebel was notorious for having great difficulty in explaining himself in clear language and those in academia had a tendency to treat his methods harshly and with some disdain as a result. 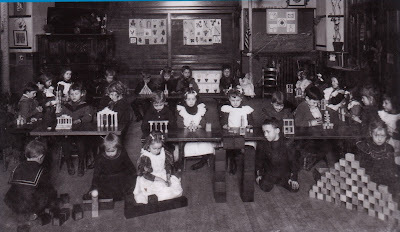 The world-wide spread of kindergarten was through the hands of educators who were completely enamored with Froebel and shared a cult-like devotion to his method. And so, as I read this interesting book, I can see the resentment that the widespread enthusiasm Kindergarten stirred up. "What's so special about the kindergarten years?" Teachers asked. Unfortunately, these days, kindergarten has become too much like the rest of schooling, with growing pressures on testing and curriculum that can be easily measured and enforced. Perhaps we would do better to make the rest of schooling more like what kindergarten was in the first place. And so it makes a tremendous difference in speaking to an academic audience that you use terminology that they can relate to. Froebel didn't. But when you begin to understand that the arts and science are two important views of physical and social reality that cannot stand alone, that are in essence the same, you begin to understand the value of symbolism and might even read Friedrich Froebel without scientific discomfort. I know I should be hesitant to discuss the "hearts and souls of learners." But there are things that we as human beings cannot fully explain as yet without resorting as did Froebel, to symbolism. The photo above is from the book. The authors's objections to Froebel's use of language was not strong enough for them to deny the validity of his method. I went to kindergarten at St. Mary's Episcopal School in Memphis and then attended 1st grade at Snowden Elementary, a public school. My teacher at Snowden was a lovely young woman, but there was no way that public school could possibly compete for glory and fun with St. Mary's Kindergarten. At Snowden, I had to learn to sit still in a desk. At St. Mary's they had an indoor swing set and sand box and more play stuff than you could imagine. And so the question is raised, "Why is 1st grade so different from Kindergarten?" How can Kindergarten be so dedicated to learning through play while 1st grade takes so much of the fun out of it? Those were the same questions asked at the University of Chicago in the early 1920's. And so I'm reading the book, "Unified Kindergarten and First-Grade Teaching" by Parker and Temple, both of the University of Chicago. 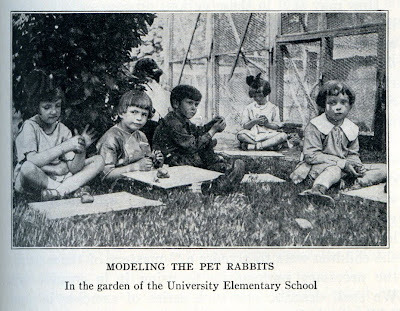 The photo above is scanned from the 1925 publication. I know I may be one of the very few people in the world still interested in such things. After all, what could we possibly learn from the educators of the such distant past? I am reminded of the man who went to the Zen master for advice. The master poured his tea, and kept overfilling the cup. When the visitor protested he asked, "How can I give you any advice? Your cup is too full. It must be empty first." With humility we discover that we have a great deal to learn from those who preceded us in the classroom. 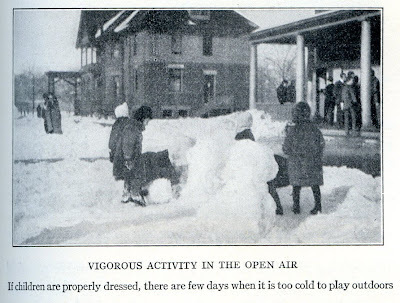 The photo below is of the recommended outdoor play. Prescribed for each and every day of the year. 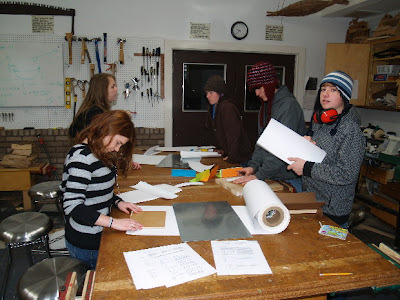 Today in the CSS wood shop we began making hand bound journals for the spring travel. This is the first time for these students to make bound books. We did what the kids thought was an unbelievable amount of paper tearing, and are not done yet. Next week we should be able to begin stitching the sections and binding them into a books. One student asked, are we only making one for all to share? But no, each will make his or her own. Making the covers will be the fun part, but you will have to stick around for a few weeks to see the finished work. 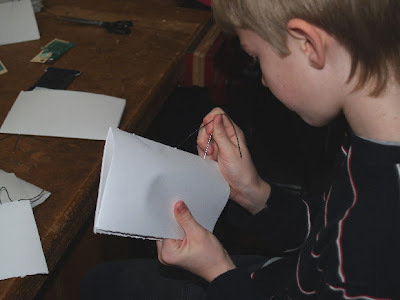 The photos show the students preparing their sheets, and the simple shop-made device and template for positioning the holes for stitching the books together. As we invest in new technologies the thrust is toward ease of use and ease of access. So they present their value to producers for a limited time as the products and methods are gradually refined. Over time, those who are employed in implementation of new technologies require less education and skill to do so, which in the case of computers, has opened the entire world as our competition. We have been able to witness this effect in nearly every industry as we moved from skilled to unskilled labor with the mechanics taking the place of skill and thus marginalizing the role of worker. 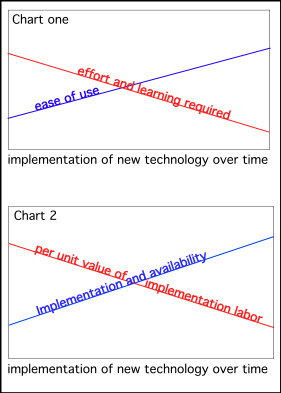 So there is an inverse relationship between ease of use and development of skill, and an inverse relationship between range of access and value. Why pay anyone to do something that you can do so effortlessly for yourself? So this morning I made these charts to try and explain it. Let me know if these mean anything to you. As parents, thinking of what children most need to know for success, most would place computer skills as top of the list, but parents most often run a generation late in their thoughts. With computers being made to make things easy, and as they become more widely accessible to all, many of those skills have become commonplace in the marketplace. Of far greater use would be creative problem solving and the kinds of people skills that enable successful team participation. Allowing your kid to hide out in the land of computer games is contraindicated. Shawn had bounced back and forth between schools, not finding a suitable fit. In the wood shop, he would have worked hours on the lathe but he could hardly wait to escape school. Outside of school he was producing his own video. He was master of a wide range of computer games. In a fit of frustration he informed me, "I hate learning." But I knew he just didn't like being taught. Self-directed learning is instinctive, natural and one of the most basic, unavoidable, hard-wired components of our humanity. It provides pleasure that can engage one endless hours to the point of exhaustion while also laying the foundations of community and cultural growth. Put a guitar in a young man's hands and watch what happens. Put a young man in a classroom and watch him watch the clock. When the bell rings, watch his escape. Are these circumstances telling us something? There is something that happens when we create structured learning environments, forcing a young man's or a young woman's hands to stillness. It isn't good. Still the hands, stifle the spirit. Procrustes was a Greek monster whose guest bed would fit each guest perfectly though you would not have wanted to be invited overnight. The bed was equipped to chop off the feet of those who were too long, and with rack and chains to stretch those who were too short. Years ago, when I had my first job working with kids at a children's center in Memphis, my supervisor John, told me the story of Procrustes as an allegory related to what happens in schools. Is Procrustes just a myth? Or does the story really fit in the most unfortunate sense? Can we take steps that encourage self-directed learning and further engage a child's natural passion for learning and for growth? How do we do that? It isn't always easy. We're working on it.